When the Boss of the Saints is kidnapped by Satan and forced into a shotgun wedding with his demonic daughter Jezebel, Johnny Gat forms a rescue plan; travel to Hell and shoot the Devil in the face. But he won't be working alone. Accompanying him into fiery Damnation is hacking whizz Kinzie Kensington, while Hell's community leaders, including Blackbeard, Vlad the Impaler and Shakespeare (yes, you read that correctly) are more than willing to lend Gat a bullet or two. 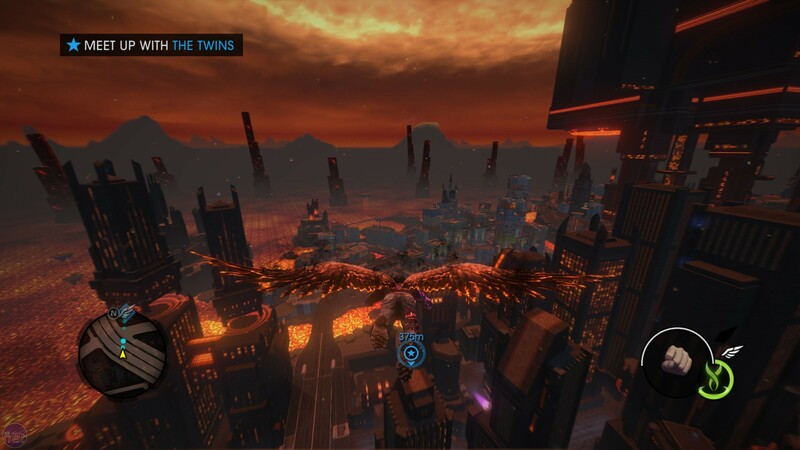 Gat out of Hell's premise is superb, another dazzlingly daft idea from Volition in their redeemed Saints Row series. The idea of the Saints licking Lucifer on his own turf is deserving of a full sequel, let alone an expansion pack. In fact, I kind of wish that's what Volition had done, because as an expansion Gat out of Hell falls short of its potential. This isn't to say Gat Out of Hell is a bad expansion pack. You'd have to be mad as Gat himself to believe such an absurdity. It offers a surprisingly large new city to explore that's typically crammed with stuff to do. Its writing is as playfully subversive as anything in the third or fourth game, and Johnny Gat's newly acquired wings are an excellent evolution of Saints Row IV's superpowers. It even has a musical number. The problem is how Gat out of Hell balances many of its features. Almost everything in the game is either reused, underused, or overused. The design of Hell is probably the best example of this. Volition's version of the Christian underworld is basically Steelport again, but broken into pieces, shaken up in a bag and then slathered in orange paint. There's a deliberate lack of environmental consistency. Highways are improbably long, bits of the city float in the sky, and the five districts are arbitrarily separated in their function. From the air Hell impresses both in its size and its vertical design. 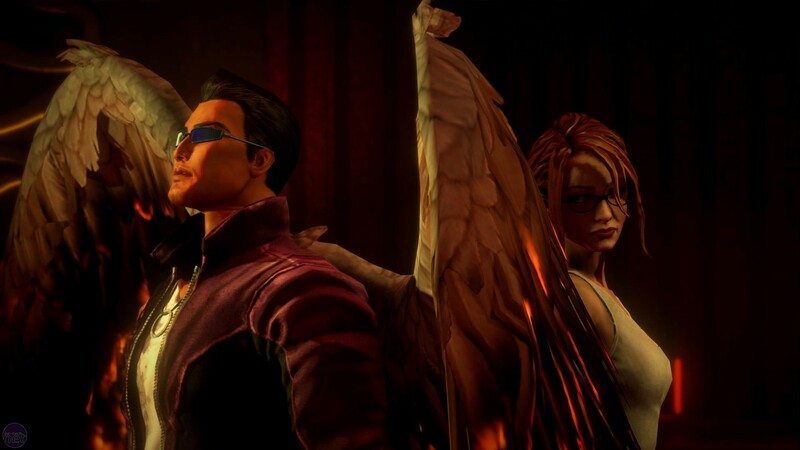 The city's skyline is crammed with cranes, skyscrapers and floating platforms, all of which complement zipping about using Johnny Gat's wings. Unfortunately, when you're on the ground Hell is considerably less attractive. The brown/orange colour palette results in an incredibly murky aesthetic, which is the absolute last thing that Saints Row's rather crusty engine needs. Moreover, three of the five city districts - the starting district, the Slums and the Barrens are a wash of crumbling grey buildings or tumbling grey rock. I know it's supposed to be Hell, but I don't think it's actually supposed to torture the player's eyes. Hell encapsulates both Volition's ambition and the reality of what they can dedicate to achieving it. It's artfully created in some areas, hastily thrown together in others. It also appears to be where the majority of Gat out of Hell's budget went. Other features you'd expect in a Saints Row game are either considerably trimmed down or missing entirely. The fantastic cut-scenes that bookended missions previously are reduced to three or four character exchanges. 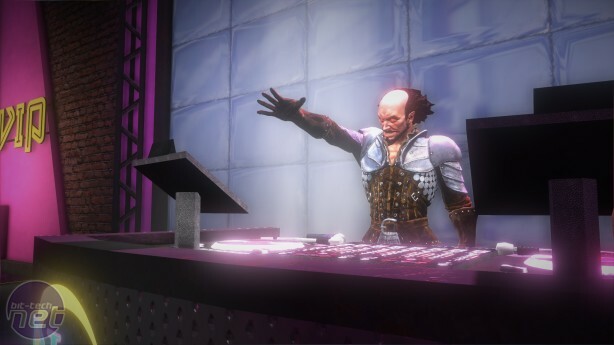 It's strange to be complaining about the lack of cut-scenes in a game, but Saint's Row actually made them worth watching through its interesting cast of characters and some of the funniest writing in recent years. 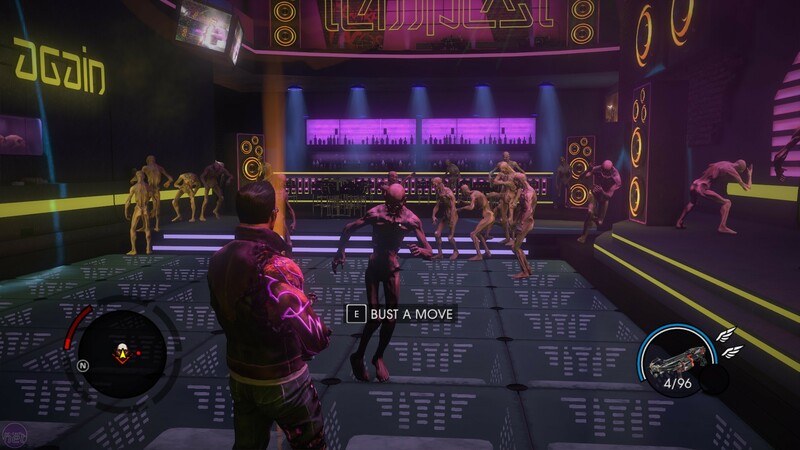 What's there is on par with the full games, and the aforementioned musical number is possibly the best thing Volition has ever done. Later on, however, when Jezebel breaks into song a second time, Gat abruptly cuts her off, yelling "We're not doing that again!" which is developer-speak for "We wanted to do this again but ran out of money."